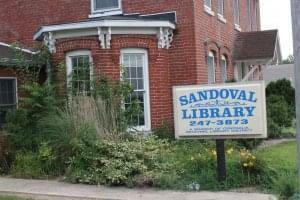 The Sandoval Village Board has been told by their attorney that a May 28th date has been set for a Judge to begin the process of removing the Village of Sandoval from the Centralia Regional Library District so Sandoval can start their own library. Mayor Pam Gelsinger is hopeful the hearing can be expanded to include the deannexation of all of Sandoval Township that was approved by township voters in the April 2nd election. She noted once the deannexation is complete, there are a lot of other things that need to happen before the Sandoval Library can reopen. Gelsinger reported she is still waiting for final paperwork from the state so work can begin on the Sandoval Park improvement. An OSLAD grant will pay for 90-percent of the cost of the overhaul of the park. A zoning board meeting has been set for Thursday, April 25th, at 6 pm at village hall to hear a request from MCC Networks in Sullivan to construct a hub building for fiber optic cable the company is installing through the area. The proposed site is on the south side of U.S. 50 just west of U.S. 51. The special use permit is needed because the land is currently zoned as residential. Approved the hiring of two summer workers. Declared May as Motorcycle Awareness Month.